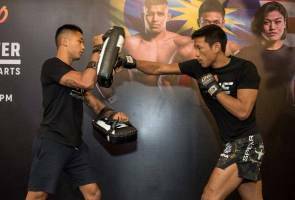 MALAYSIANS are guaranteed a delightful display of martial arts whenever Kuala Lumpur-based martial artist Keanu Subba graces The Home of Martial Arts. Whether it’s his in-Circle mastery or specialty in Brazilian-Jiu Jitsu, the 24-year-old has forged a reputation as one of the organization’s most exciting martial artist to watch, as proved by his 100 percent finish rate. We relive some of Subba’s greatest ONE Championship finishes ahead of his return against Ryogo Takahashi at ONE: FOR HONOR at the Istora Senayan in Jakarta on 3 May. Arriving in the Circle to a crowd roaring in support of their hometown hero Phoe Thaw, Subba had it all to do. But the Malaysian athlete kept his cool and settled the contest in quick fashion. He kept a good distance from his opponent at the start before pouncing on an early takedown barely a minute into the contest. Phoe Thaw broke free from his back on the ground but moments later the Monarchy MMA athlete gained side control, and the battle went back to the canvas. The lethwei practitioner defended well but his second attempt at breaking free left him staring at defeat. Subba got a grip on his neck before tightening it around his arms as the Myanmar hero was forced to tap out at 2:47 of the opening stanza. Subba returned in emphatic fashion nearly a year on since his last ONE Championship appearance with a stunning submission victory against Chinese opposition “White Dragon” Xie Chao at ONE: PURSUIT OF POWER in Malaysia. An outside trip takedown marked the beginning of the end for Xie, as Subba worked his way into his opponent’s half guard. After dropping several elbow strikes onto Xie, the Malaysian hero spun onto his opponent’s back and into the mount, pulling off an impressive armbar. Xie was resilient, but a slight readjustment was enough for Subba to force the tap, and seal a triumphant return in his hometown of Kuala Lumpur. It was another typical display from Subba at ONE: UNBREAKABLE WARRIORS despite his opponent Waqar Umar starting the duel in a more attacking style. Umar immediately took the tie to the canvas before securing top position and landing strikes on Subba. Both athletes possessed a great ground ability, and Subba ultimately countered with a single-leg takedown before establishing control on top. Umar still went in search of another submission, but that eventually allowed Subba several openings to punch his way through victory.